Interestingly only half of the BRICS show manufacturing sectors that are "sinking like a brick". China and Russia have sectors whose indices are very near the 50 level, a level that marks manufacturing stagnation. They each have queue percentile standings over the period from January 2015 that position their respective PMIs in the lower fortieth percentile of their historic queues of data. But, in contrast fellow BRICs, Brazil and India, are tied for the highest queue standings for this period among all the countries and regions listed in the table with a 94 queue percentile standing. They are by far the exceptions. 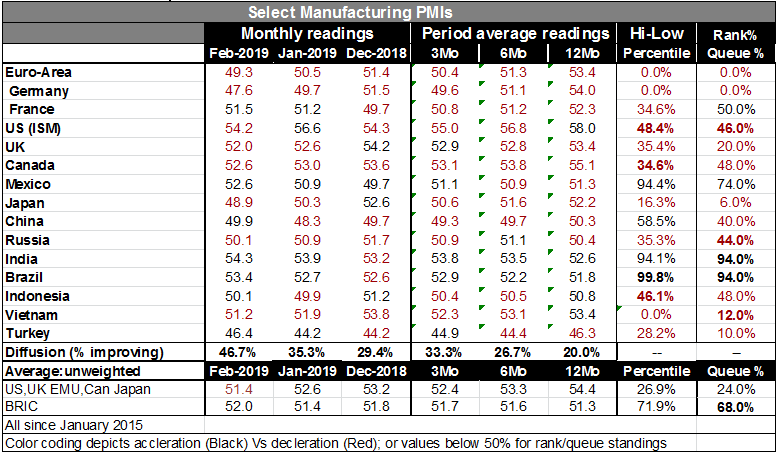 After the lofty queue standings posted by Brazil and India the next highest queue standing is the 74th percentile by Mexico and then the ranking drops off to the 50th percentile standing posted by the US manufacturing sector on its ISM gauge. Among the 15 countries in the table only FOUR have queue percentile standings at or above their 50 percentile mark which designates their median value for this period. This is an indication of widespread weakness. Chart 1 shows the sharp and ongoing run down in the manufacturing PMIs for the US, the UK and the Euro Area. The Euro Area and Germany are posting the weakest manufacturing PMIs of this period. Similarly Japan has a very weak 6% percentile queue PMI standing with Vietnam (12%) and Turkey (10%) all at extremely weak levels compared to their history since January of 2015. In fact more counties in the table show declines in their month-to-month PMI changes that show increases for all months back to June of 2018 with the lone exception that in November of 2018 the mix between countries with rising and falling PMIs was balanced at 50%. This has been a long string of persistent MFG PMI weakening. The second graph shows that this has occurred as the Baltic Dry goods index of shipping volume has fallen steadily and abruptly. If fewer goods are being produced obviously fewer will also be shipped. The fall-off in the Baltic index is quite abrupt but not exactly unprecedented. Clearly ongoing trade disputes and pending negotiations are interacting with weakening growth to produce this result. As GDP growth weakens trade growth naturally will slow and if tariffs reduce imports the existence of increased tariffs will reduce trade flows and those factors are present. In historic perspective the drop is not "excessive". But it accords with other slowdown periods. The third chart gives us a bit more perspective on the Baltic index. On this 12-month percent change format based on monthly data the drop in the index is not as severe-looking as for the daily data in Chart 2 but it is still significant and worrisome in its own way. While there have been other dips that show year on year declines in the Baltic index during expansion periods there also are relatively deeper or longer dips that occur in recession. The sluggish recovery from recession 2010-2012 and again in 2015 as well as earlier in 2005 showed year-on-year declines in this index. Some of those declines were even more severe than this one (at least so far). But there is reason enough to treat this index as important and as waving a caution flag to central bankers or even AT central bankers. The US manufacturing ISM today fell by a large 2.4 diffusion points making it the fifth largest months drop in the last 50 months (Since January of 2015). This is not a reassuring development. Price and employment components in this report are at 12-month lows. The US data have waffled but the MFG ISM is clearly pointing to weaker times ahead quite unlike the Chicago PMI released in the US a day ago. News, however, always seems to run hot and cold. Germany today issued its strongest retail sales gain in several years with retail sales surging by 3.3% month to month...unfortunately that still did not quite make up for the 3.4% drop that sales executed a month ago. Real German retail sales are, however, up by 2.4% over 12-months but with unit auto sales falling by 1.9% on that time line. German is in good shape but show no sign of gaining momentum. Talk is cheap...oh, is it? As always the future will be whatever it is. We will make fools of ourselves trying to get one step ahead of it. Central banks have now - for now? - stopped playing the game of fools and no longer feel they have a clear path to higher interest rates has the consequences of their past actions are catching up to them- at least for the Federal Reserve in the US. And there are other man-made issues to be confronted such as US –China trade negotiations, Brexit and there will be at some point US-EU trade talks as well. It is said that task in cheap but at this time all the talk seems to be coming with a steep price tag attached.